Warbarons • View topic - Dragon Realms [9.0] is submitted for review. Dragon Realms [9.0] is submitted for review. Discuss maps and help map makers make the best possible maps. New map: Dragon Realms [9.0] by somenpotatis. Re: Dragon Realms [9.0] is submitted for review. I'm still not convinced the central starting positions are playable at all since they are so exposed, but the map plays fine for 3 players. Will launch a new 5-player FFA to try out the changes. Please join and tell me what you think! Right now I see you have one FFA start enabled. That has all 5 positions and they will be chosen randomly. That's fine for a 5 player FFA but not so great for other ones. You might want to add an additional FFA start for 3 players and just enable Red, Black and Blue since our 3 player test game worked nicely. I'd also suggest enabling 1v1 game. Maybe use Orange/White. That would put both players in the middle and right on top of each other but leave lots of area for expansion outward while guarding against a quick invasion. You could have other 1v1 starts of say Red/Black, Blue/Black, Blue/Red if players wanted to start far apart (but I like the idea of Orange/White as the default 1v1). You might even be able to get 2v2 games using something like Blue/Orange vs White/Black OR Blue/White vs Black/Orange. I think in 5 player FFA the 2 middle players will have to quickly sign an NAP with each other and maybe one other side. If they do that it will make for interesting play but if there is no diplomacy then it's going to be very hard to win from the middle. You're absolutley right. 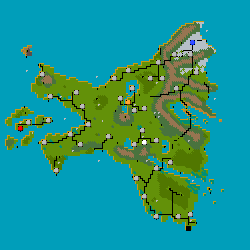 Somehow i submitted the original "scenario"-fork of this map. The one you, me and Brutus played was the FFA-version with the different FFA and team variations of which you speak (havn't added the red/black or blue/red setups though, so thanks for the suggestion!). At the risk of cluttering the board I could also submit the FFA map, but the only difference really are added neutral defenders to all capitals to make unused capitals harder to capture when not using all five teams. The game i currently started is the 5-player FFA version. Just submit 1 version of the map with all the start choices for 3 & 5 player FFA, 1v1, 2v2 etc. Extra defenders in capitals is fine for all versions / starting setups of the map . Both versions are now submitted. I don't know if there is any reason to keep updating the scenario-version as the FFA-version is more versatile (it however loses the early access to dragons due to automatic randomizing of starting units)? Yeah, it's a shame that you can't have scenario mode and non-scenario mode on the same map. So I guess it's worth keeping the scenario map around for the Dragon start (which I like). The only other option would be to put Green Dragons in the city next to the capitol and make it weakly defended (1 lt infantry) so that players would capture Dragon production on turn 1.